There are things that we do in our day-to-day lives that can make us age beyond our years. As we get older, we want to make sure that we’re doing things in our lives to keep us as healthy as possible, rather than adding years onto our bodies. There are habits that we do every day that can age us faster. Being able to recognize these habits will make it easier to quit them, so that we can keep our bodies and minds young, and make sure that we’re not aging ourselves. Science has proven that avoiding these specific habits will keep you young. "Sleep is important.” We’ve heard these three words – or some variation of them – over and over again. Yet, despite the mass of knowledge available explaining the essential nature of sleep, many of us shrug it off. 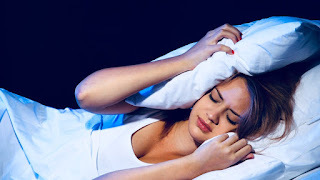 When we see a doctor about our sleep troubles, they are all-too-eager to prescribe a “knock-me-out pill.” (See: “Valium, Xanax, usage.”) It’s more time-consuming to evaluate things like diet and exercise and how they may be affecting our shut-eye. It goes without saying that both diet and exercise profoundly influence sleep quality. Relatedly, both have various effects on the absorption and activity of vitamins and minerals. The highly-criticised Miss Universe Singapore 2018 national costume has spawned a photoshop battle on social media, drawing submissions from dozens of netizens. 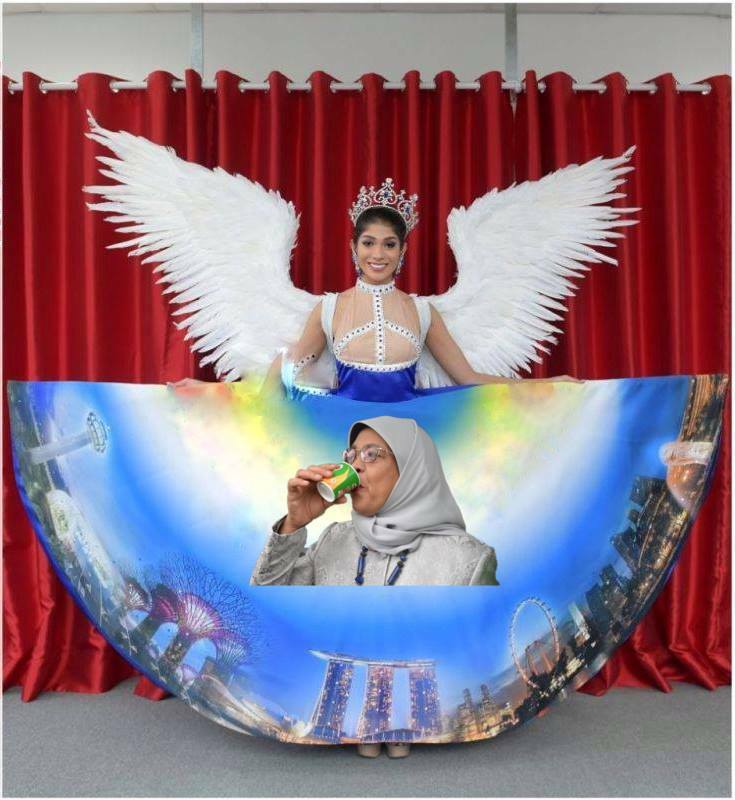 Some of those who took part in the photoshop battle replaced the digital image on the skirt of the dress with notable Singapore icons, foods and prominent figures, while others used other creative images to create an optical illusion. 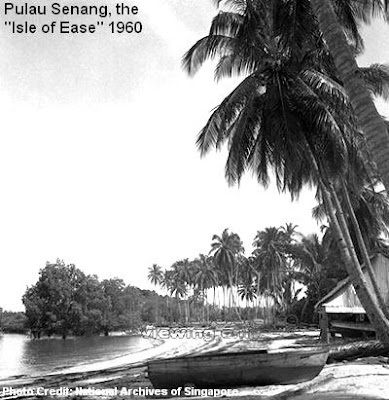 Other netizens also featured images and quotes by prominent figures in their submissions. Establishment figures like the late Founding Prime Minister Lee Kuan Yew, his son and current Prime Minister Lee Hsien Loong, Lee Hsien Loong’s wife and Temasek CEO Ho Ching in her infamous sandals, and President Halimah Yacob were among those featured in the photoshop battle. President Halimah Yacob will be performing at the President’s Star Charity 2018 event on Sunday (14 Oct) this month. She will be taking to the stage, along with her husband in a special closing performance together with The Purple Symphony, Singapore’s largest inclusive orchestra that includes musicians with special needs, as well as singer Aisyah Aziz, visually-handicapped singer Wai Yee and the Purple Choir Kids. President Halimah Yacob and her husband are going to be among the performers at the President’s Star Charity 2018 that will be telecast live this Sunday. The President and her husband will take to the stage for a special closing performance, alongside The Purple Symphony, – Singapore’s first and largest all-inclusive orchestra that includes Singaporeans with and without special needs – visually-handicapped singer Wai Yee and singer Aisyah Aziz. This is President Halimah’s second President’s Star Charity show and her third major charity event, after the annual President’s Challenge earlier this year. 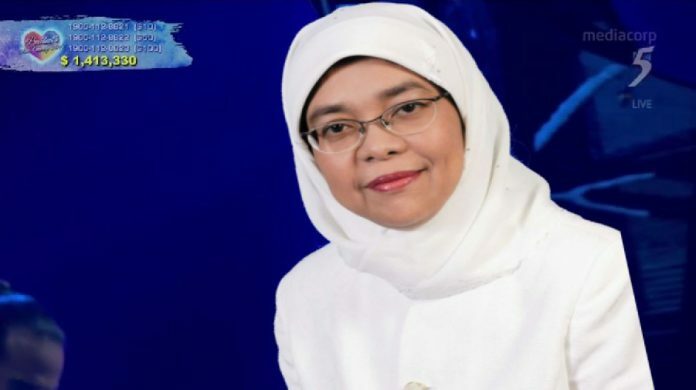 A “down-to-earth” president with a “common touch” – these are some of the descriptions of Mdm Halimah Yacob, Singapore’s first woman president, in media reports since she took office one year ago. 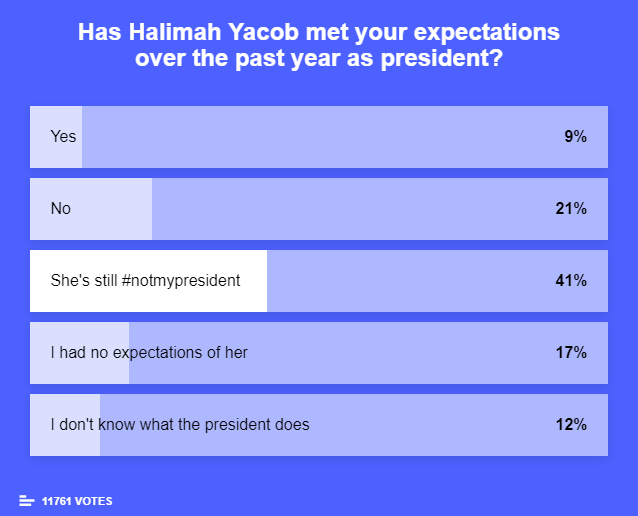 The former Speaker of Parliament was named president without a single vote being cast, as she was the only candidate to be awarded a Certificate of Eligibility in an election reserved for Malay candidates - which sparked online displeasure and the use of the #notmypresident hashtag. 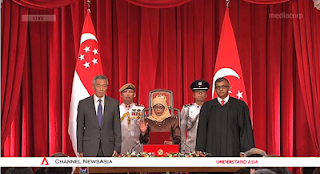 Since she was sworn in on 14 September 2017, Mdm Halimah has received foreign dignitaries, invited Donald Trump to Singapore for a state visit in November 2018, attended NDP 2018 and participated in community events ranging from the President’s Star Charity 2017, the Garden Festival Orchid Show to the launch of a new Milo drink. I was delighted to launch the world’s first MILO Gao Kosong yesterday. It is heartening that Nestle has taken my suggestion to create a version of MILO with zero table sugar added. I suggested this idea when I met the team during the Healthy Lifestyle Festival SG 2017. Congratulations, Nestle Singapore, and keep up your efforts in helping Singaporeans stay healthy. Fans of Milo can now get their beverage in a formula without any added sugar. Milo Gao Kosong contains only natural sugars from malt and milk, which means it has 9.7g of sugar in each serving compared to 13.5g of sugar in the regular formula. 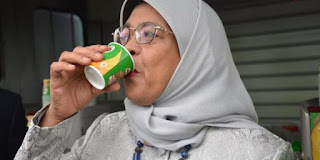 The beverage was launched on Tuesday (June 19) by President Halimah Yacob, who made and drank the first official cup of the Gao Kosong, at Plaza Singapura. Inspired by President Halimah Yacob & in line with the national agenda to reduce sugar intake, Milo unveiled its latest offering, Milo Gao Kosong, at the Milo Gao Kosong Pit Stop at Plaza Singapura Outdoor Front Plaza yesterday. 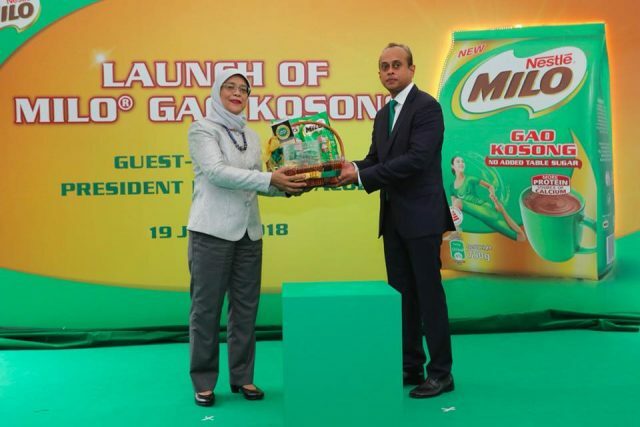 Madam Halimah helped make the 1st cup of Milo Gao Kosong - the 1st Milo powder with no added table sugar - at the event, with Nestle Singapore's managing director Rajiv Deraniyagala. She also sampled the new product, which is endorsed by the Health Promotion Board's Healthier Choice Symbol programme and promises the signature taste with higher levels of protein and calcium. 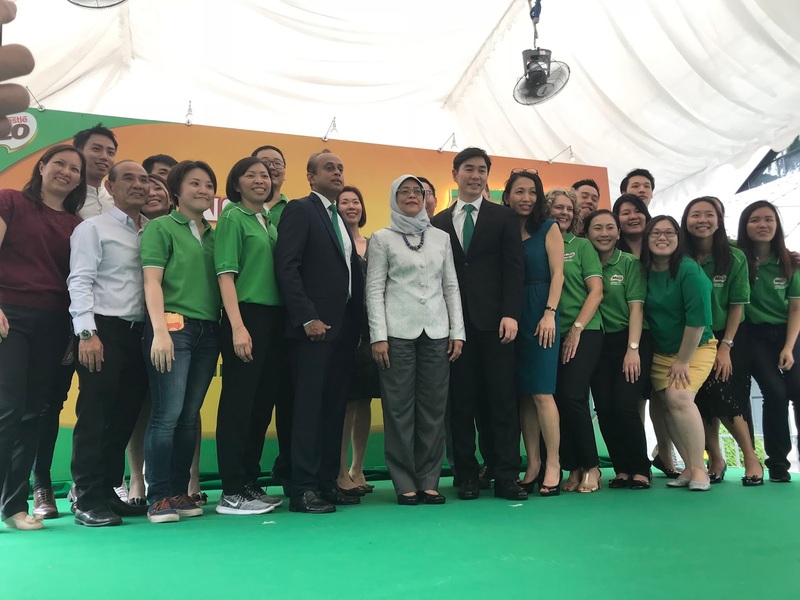 Beverage brand Milo on Tuesday (Jun 19) launched a variant of the drink with no added table sugar, in a move welcomed by the Health Promotion Board (HPB). The Gao Kosong version only contains sugar that is naturally present in milk & malt - the two key ingredients in Milo. Speaking at the pop-up Milo Gao Kosong Pit Stop at Plaza Singapura, where President Halimah Yacob was also in attendance, Nestle Singapore managing director Rajiv Deraniyagala said that the drink is the result of a challenge posed by the President. The Health Promotion Board (HPB) has included the drink in its Healthier Choice Symbol programme, which highlights healthier packaged food options. The board said that it looks forward to more companies coming on board with options to encourage consumers to reduce sugar intake from beverages. The new formula, which was developed & produced in Singapore, comes as Singapore battles a high rate of diabetes in its population. Sugared drinks could soon be taxed, Health Minister Gan Kim Yong said in an exclusive interview with The Straits Times on Monday, as part of Singapore's war against diabetes. SEBAGAI langkah menyokong gerakan pemerintah mengurangkan kadar pengambilan gula dalam kalangan penduduk Singapura, Nestle Singapura telah memperkenalkan produk yang diperbaharui kandungannya - Milo Gao Kosong. Minuman Milo kegemaran ramai ini mengekalkan rasa semula jadi bijirin dan susu, bagaimanapun kini tanpa tambahan gula. Milo Gao Kosong merupakan produk yang diperbaharui dari produk minuman Milo Gao Siew Dai dengan pengurangan gula. namun dengan 30 peratus lebih banyak khasiat. 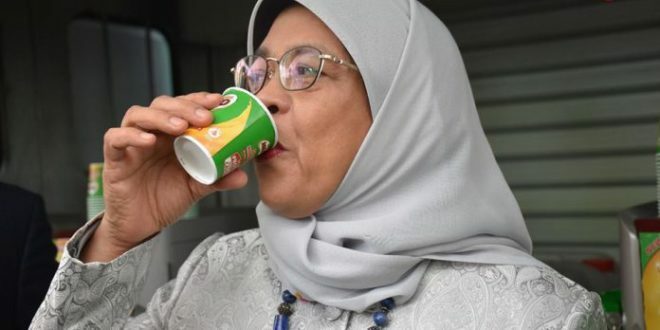 Diperkenalkan buat pertama kali di sini, serbuk minuman itu telah dilancarkan oleh Presiden Halimah Yacob di acara Milo Gao Kosong Pit Stop di pusat beli-belah Plaza Singapura semalam. Milo on Tuesday launched a variant of the drink with no added table sugar and named the beverage ‘Milo Gao Kosong’. Nestle Singapore managing director Rajiv Deraniyagala said that the beverage was produced as a result of a challenge posed by President Halimah Yacob. 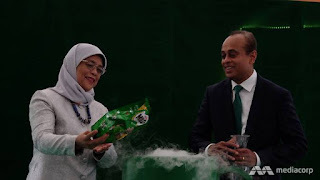 “It was about eight, nine months ago when we had this conversation with President Halimah Yacob on what we can do to reduce the sugar in Milo,” Mr Deraniyagala said. Nestle Singapore introduced another variant of Milo in July last year. The product christened ‘Milo Gao Siew Dai’ has 50 per cent less table sugar and 30 per cent more protein than the original formula. When they launched this product the President challenged the beverage maker to make a Milo product with no added sugar. 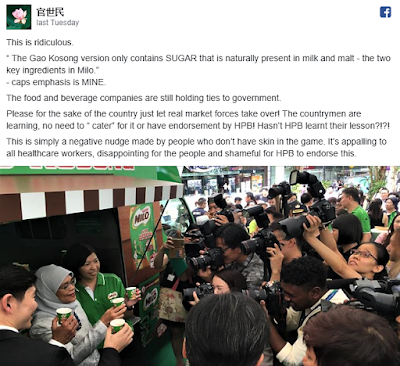 “ The Gao Kosong version only contains SUGAR that is naturally present in milk and malt - the two key ingredients in Milo.” - caps emphasis is MINE. The food and beverage companies are still holding ties to government. Please for the sake of the country just let real market forces take over! The countrymen are learning, no need to “ cater” for it or have endorsement by HPB! Hasn’t HPB learnt their lesson?!?! This is simply a negative nudge made by people who don’t have skin in the game. It’s appalling to all healthcare workers, disappointing for the people and shameful for HPB to endorse this. PAP should review and increase the president’s salary as she has become a national embarrassment, ie becomes promoter for Milo. 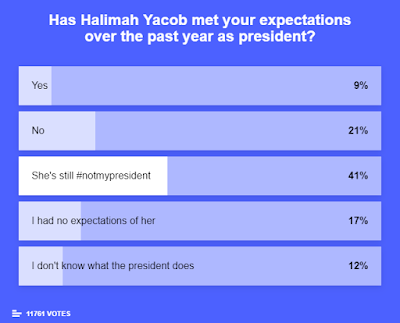 When compared with same-race president Nathan, President Halimah appears to be grossly underpaid. Both jagas of our reserves, CPF balance was only $90 billion under Nathan in 2000. Current CPF balance: $368 billion and growing. President Halimah Yacob has unwittingly broke the law by advertising “Milo Gao Kosong” for private corporation Nestle Singapore. Some say that’s not her job. Some say President shouldn’t promote commercial products. Others say it’s not new because milo tin doesn’t contain sugar. Pictures of President Halimah launching Milo Gao Kosong seemed to have gotten Singaporeans pretty riled up. 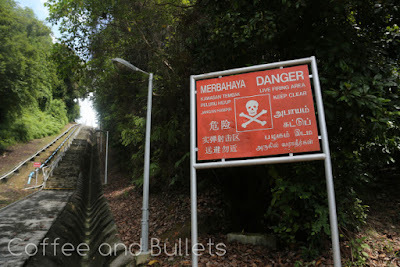 Aiyoh…relak a bit lah. 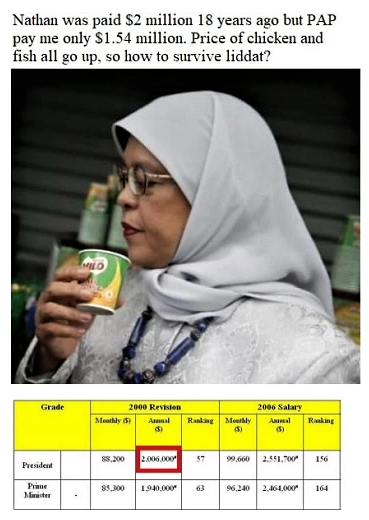 President Halimah promoting Milo kosong lah, not kosong in people’s bank account. Milo Gao Kosong officially launches in Singapore! MILO, Singapore’s most-loved brand, together with President Halimah Yacob, unveils a new variant of the local favourite health drink – MILO Gao Kosong. The world’s first MILO powder with zero added table sugar, MILO Gao Kosong retains the signature MILO taste with naturally occurring goodness from milk and malt, for Singaporeans looking to enjoy their favourite beverage without the sweetness. 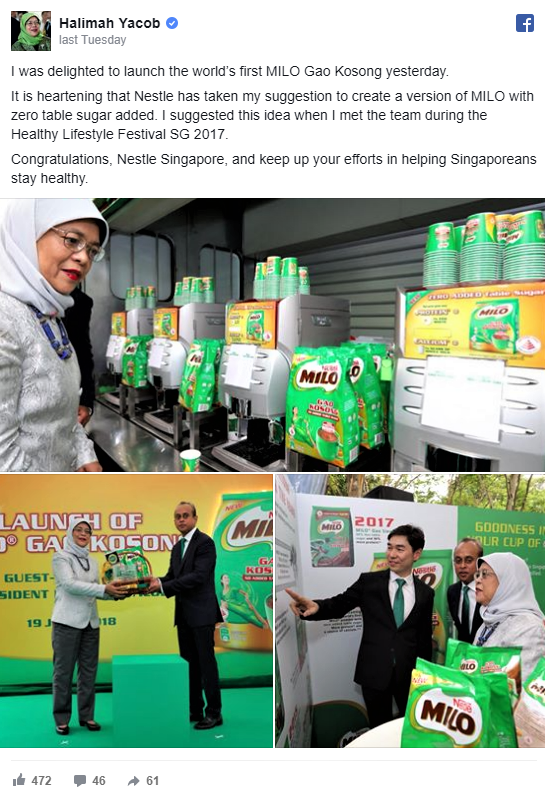 Developed and produced in Singapore for Singaporeans, MILO Gao Kosong also has higher levels of protein and calcium, providing Singaporeans with the nutrition needed to maintain a healthy lifestyle. MILO Gao Kosong is a further sugar reduction from MILO Gao Siew Dai that has 50% less table sugar and 30% more protein. MILO Gao Siew Dai was launched last year and has been favourably received by consumers. 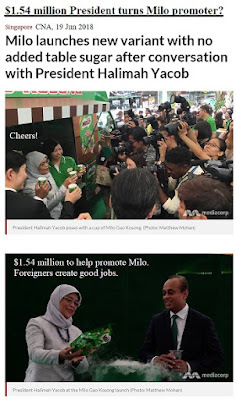 President Halimah becomes Milo promoter after Trump-Kim summit? Do businesses need to have a conversation with jiak liow bee president to launch new products? Where was President Halimah Yacob during the high profile Donald Trump-Kim Jong Un meeting? 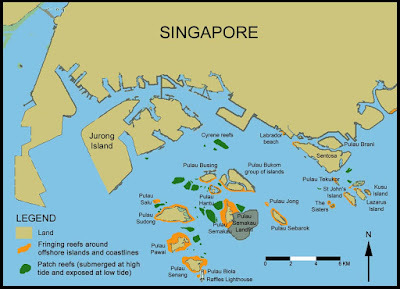 Singapore’s head of state was missing even at her own residence in Istana. 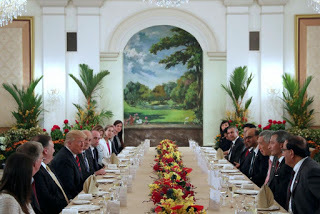 The Indian-turned-Malay President had to deliberately vacate her own residence when Lee Hsien Loong separately hosted lunch with Donald Trump and Kim Jong Un. The Istana, in the Malay language means “Malay palace”. However at both lunches, Lee Hsien Loong brought only Chinese and Indian Singaporeans to the table. How embarrassing is it going to a Malay palace without seeing a single Malay. The issue is made worse when lower-ranked officials and ministers with no involvement with foreign affairs were chosen over Halimah Yacob. The Singapore President could have taken the place of Law Minister K Shanmugam, Deputy PM Tharman Shanmugaratnam and National Development Minister Lawrence Wong, but the S$1.5 million-a-year Halimah Yacob was not chosen. Lee Hsien Loong’s decision to leave Halimah Yacob is open to speculation, but this appears to be passive racism. The Singapore Prime Minister nonetheless need to be questioned, like whether if he perceives Halimah Yacob’s hijab a poor representation to Singapore. 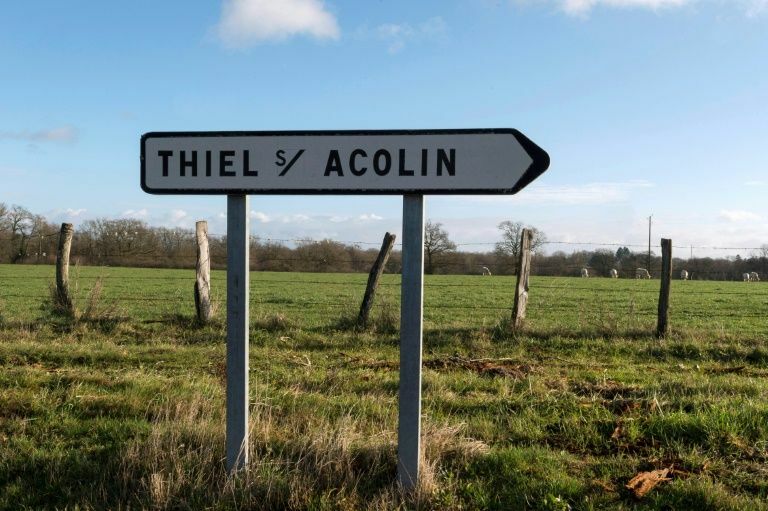 In the peaceful French village of Thiel-sur-Acolin, retired farmer Marc Bernardet is ambivalent about having a Chinese billionaire for a neighbour. 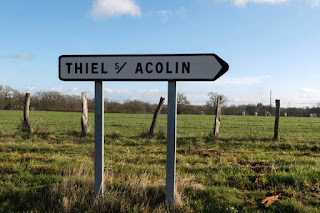 Over the past four years Hu Keqin has quietly snapped up 3,000 hectares of wheat fields in the central Indre and Allier regions, including next door to Bernardet. His purchases are part of a Chinese buying-spree in recent years stretching from the US to Australia. And in France, struggling farmers fear a landgrab. "It's a piece of French heritage that is being taken, but that's globalisation and that's the trend at the moment," Bernardet told AFP. "If it wasn't the Chinese, it would be someone else." 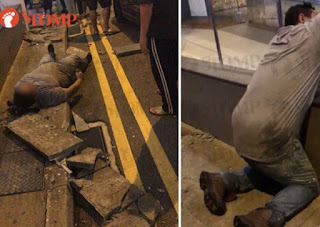 A man was hit by falling concrete slabs outside Wanderlust Hotel in the Jalan Besar area on Tuesday night (Nov 26). Stomp understands that the man had been sitting on a ledge outside the hotel when the incident occurred. He is understood to have sustained spinal injuries & is unable to move the lower part of his body. A 35-yr-old Malaysian man suffered spinal injuries after he was struck by falling concrete outside a boutique hotel in Little India on Tuesday night (Nov 27). The Singapore Civil Defence Force (SCDF) told The Straits Times that it received a call for medical assistance at Wanderlust Hotel at 2 Dickson Road at 11.40pm. The man was taken to Tan Tock Seng Hospital. 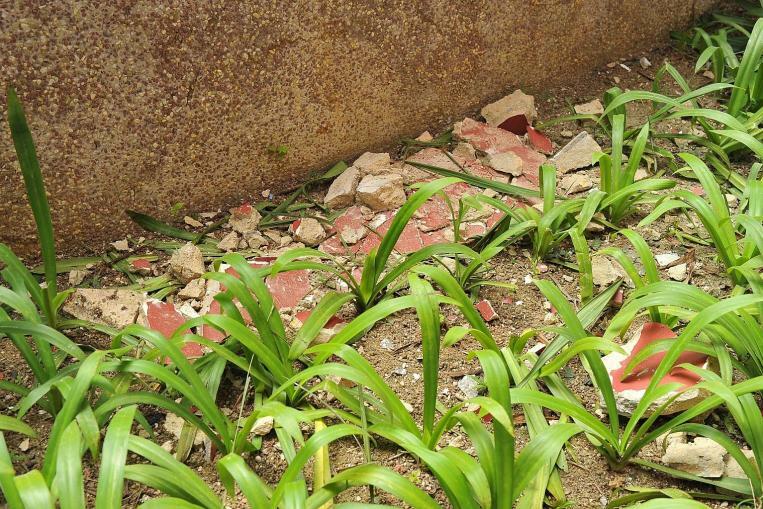 The peaceful afternoon atmosphere in Bedok Reservoir Road was shattered on Thu (Nov 8), as bricks from the external facade of an HDB block dropped and fell nine storeys to the ground. 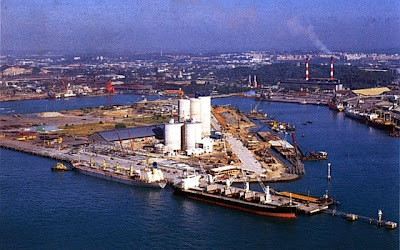 According to Chinese newspaper Shin Min Daily News, the incident occurred at Block 634 at around 3pm. No injuries were reported. 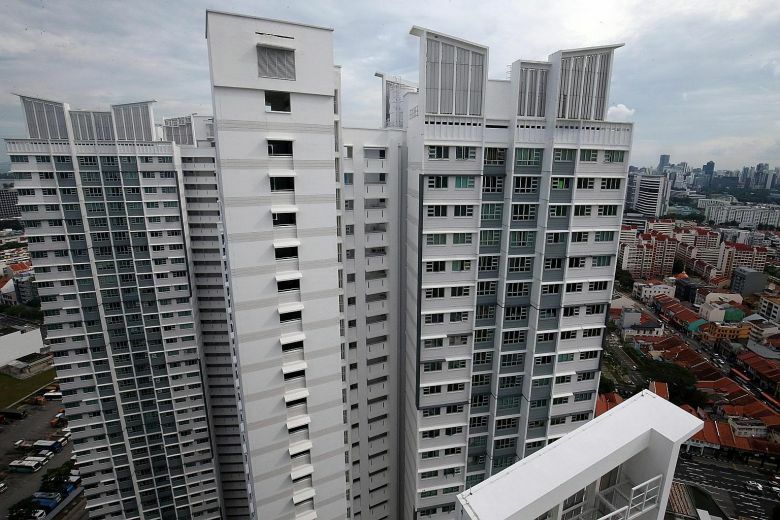 A resident on the 9th floor, who did not wish to be named, told The Straits Times that this was the first time such an incident had happened in the 17 yrs that she had been living there. Some tiles were dislodged from a wall on the 5th-floor of Block 462 Hougang Avenue 10 at about 7.40pm on Saturday (July 7) during a heavy rain, shocking Stomper Tay & her student who were practising line dancing at the void deck. Tay who teaches line dancing, told Stomp in a phone interview that she & her students would usually practise at the communal hall at Block 461. However, due to the downpour yesterday, she was forced to cancel the session. Instead, she met up with a student at 7.30pm to practise at the void deck of Block 462. Ten minutes into their practice, the two suddenly heard a loud “explosion”. A decorative panel fell 40 storeys from the top of a Housing Board Block in Bendemeer Road last Saturday evening (June 23). No one was hurt in the incident, which happened at Block 10B Bendemeer Road at about 7pm. In response to queries from The Straits Times, the Housing Board & Jalan Besar Town Council said they were informed about the incident at around 10pm. Don’t forget your industrial-strength umbrella when you walk home these couple of days because it’s been cloudy with a chance of falling metal in Singapore. Decorative fixtures in particular. 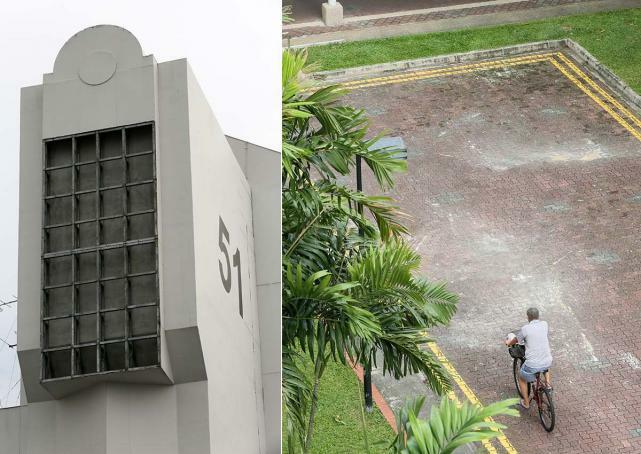 The Bendemeer road incident comes less than a week after a remarkably similar incident at a Pasir Ris housing block. 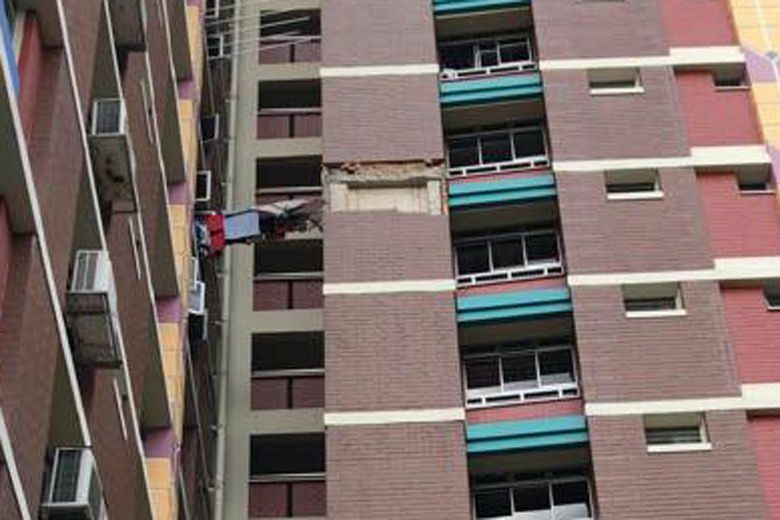 The Singapore Democratic Party has urged the Government to “take urgent and comprehensive action to ensure the structural safety of HDB buildings before injury or, worse, death results.” This, after a piece of decorative panel fell 40 storeys from a HDB block at Bendemeer Road and landed with a “loud crash” beside a playground, earlier this week. 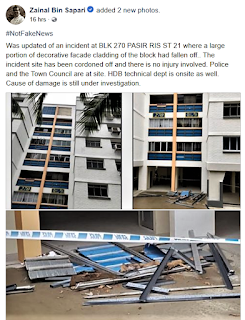 Asserting that this isn’t the first incident of pieces falling off HDB blocks, the opposition party pointed to several similar incidents from 2016 onwards. 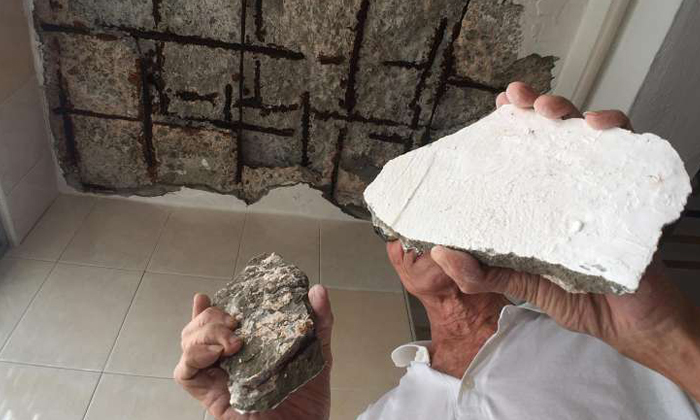 In September 2016, a concrete slab dislodged from Block 201E at Tampines while a cladding panel broke off Block 51, Circuit Road less than a month later. 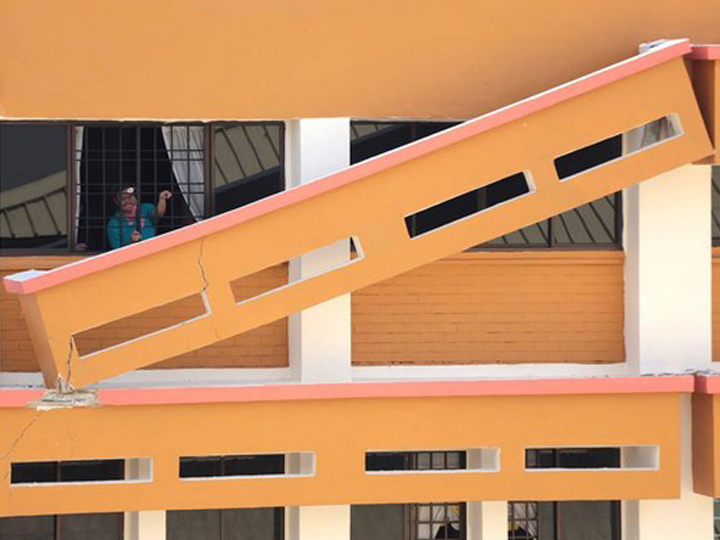 A month after that, a slab of plaster dropped 12 storeys down a HDB block in Hougang. 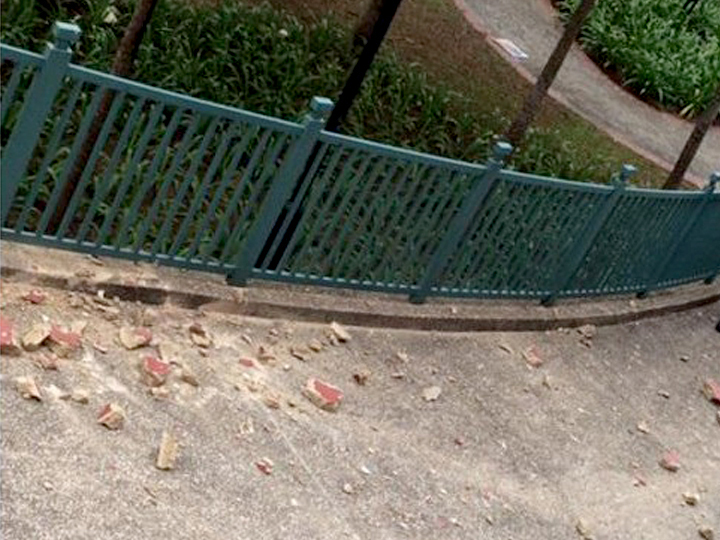 A decorative panel fell 40 storeys from an HDB block in Bendemeer Road "with a loud crash” next to a playground. Luckily, no one was injured. The mishap could have been deadly – involving children. The authorities said that the cladding panels broke off due to wear and tear. But the buildings involved are relative new. Yet, pieces are breaking off and endangering public safety. 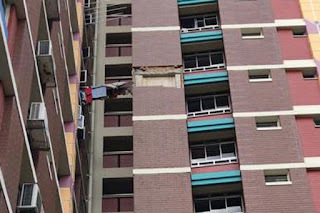 HDB blocks have also been plagued with faulty lifts that have resulted in residents being injured including one death. 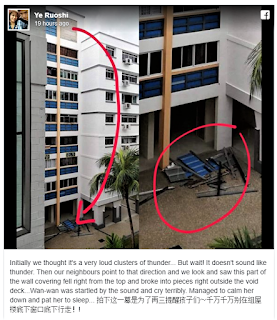 She was playing with her 3-month-old baby in her 8th-storey Pasir Ris Housing Board flat when she heard a thunderous noise. Alarmed, Madam Ye Ruoshi, 45, looked out of her living room window and saw her neighbours pointing at the next block. 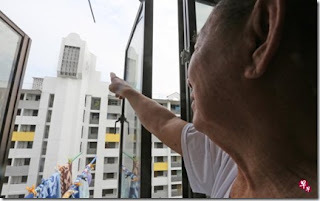 She looked up and realised that a portion of the decorative cladding on the facade of the block had fallen from a height of about eight storeys, crashing and shattering on the walkway below. A decorative structure on a Housing Board block in Pasir Ris fell from a height of at least 8 storeys on Monday morning (June 18). 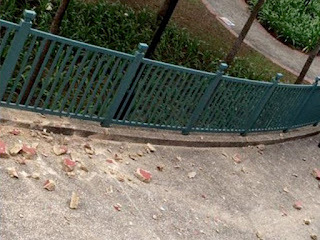 The incident at Block 270 Pasir Ris Street 21 startled Ms Ye Ruoshi, who was feeding her 3-month-old daughter at around 11am when she heard a loud crash that sounded like thunder. "At first I thought it was thunder because it was drizzling, but it was such a loud crashing sound that we thought maybe something fell," the 45-yr-old artist told The Straits Times. 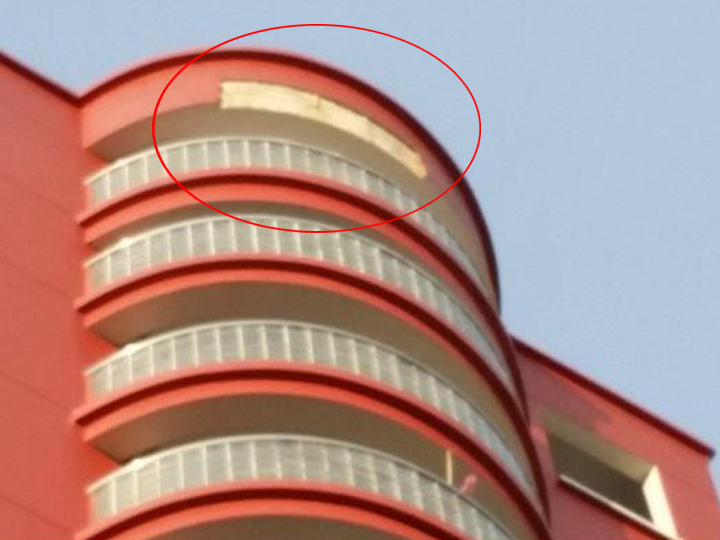 Investigations are ongoing after part of an HDB block's decorative cladding fell off its facade. 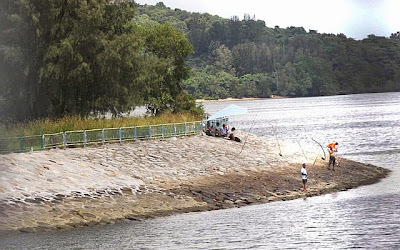 The incident happened at Block 270 Pasir Ris Street 21, according to a FaceBook post by Pasir Ris-Punggol GRC Member of Parliament (MP) Zainal Sapari on Monday (Jun 18) at about 3pm. "A large portion of decorative facade cladding of the block had fallen off," wrote the MP. "The incident site has been cordoned off & there is no injury involved. Photos of the incident were uploaded in a Facebook post by the Member of Parliament (MP) of Pasir Ris East Constituency, Mr Zainal Bin Sapari, at about 3.40pm. The photos show metal beams & debris on the ground floor. The area was also cordoned off. Pasir Ris residents got a shock when a panel of decorative cladding at the top floor of an apartment block in Pasir Ris Street 21 suddenly came off and smashed onto the floor outside its void deck. 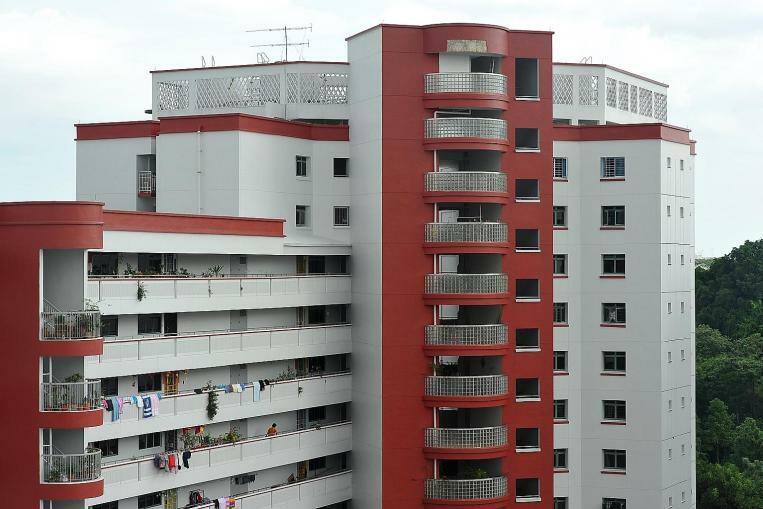 A resident who stays in a neighbouring block uploaded photos of it to her Facebook page. Thankfully, it’s been confirmed that no injuries were reported in the incident. 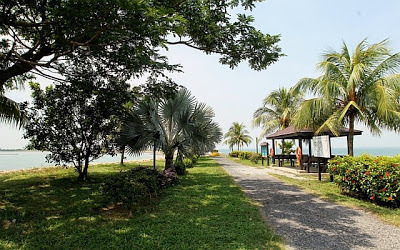 Pasir Ris-Punggol Member of Parliament Zainal bin Sapari took to his Facebook page later on Monday afternoon to share his update on what happened. 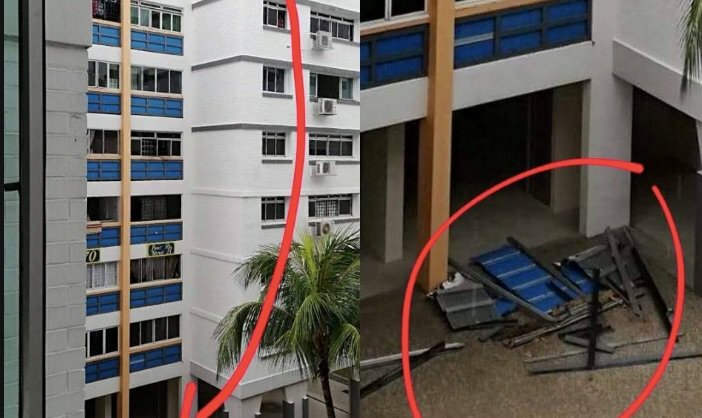 Photos of decorative facade cladding that had fallen off of a block at Pasir Ris have been going viral online. 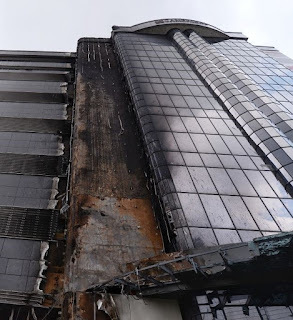 The portion of decorative façade cladding looked to have fallen from a height of about ten storeys high and was made of metal and possibly wood. 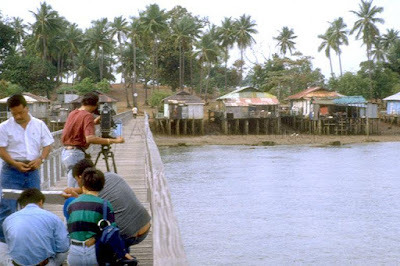 Netizens were mostly relieved that no injuries were sustained to anyone. On Monday (18 Jun), Facebook user Ye Ruoshi made a post about the facade of a HDB block falling. 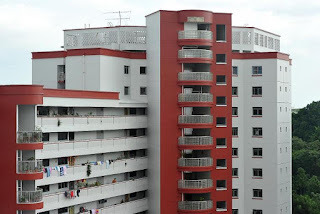 The incident is said to have taken place at Block 270 Pasir Ris Street 21, where the block of flats are around 20 years old. 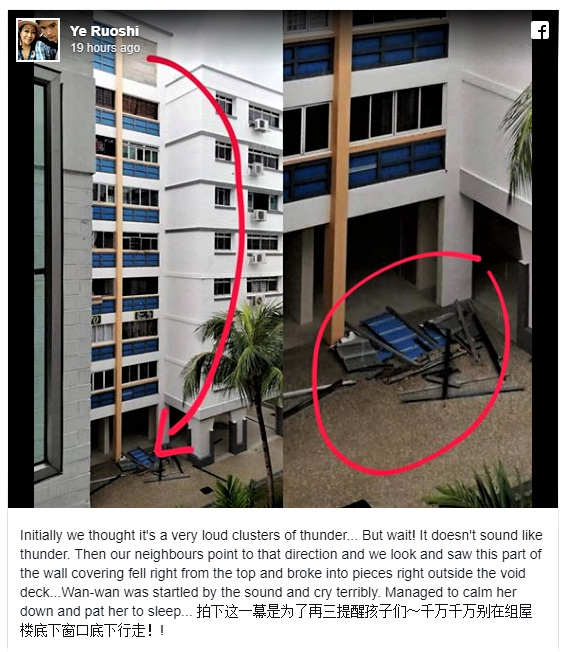 She said in the Facebook post that the incident sounded like a “very loud cluster of thunders” and did not realise the wall covering had fallen off till her neighbours pointed to her to the fallen debris. Ye’s infant daughter was affected by the incident and started to cry before being put to bed. Initially we thought it's a very loud clusters of thunder... But wait! It doesn't sound like thunder. Then our neighbours point to that direction and we look and saw this part of the wall covering fell right from the top and broke into pieces right outside the void deck...Wan-wan was startled by the sound and cry terribly. Managed to calm her down and pat her to sleep... 拍下这一幕是为了再三提醒孩子们～千万千万别在组屋楼底下窗口底下行走！! 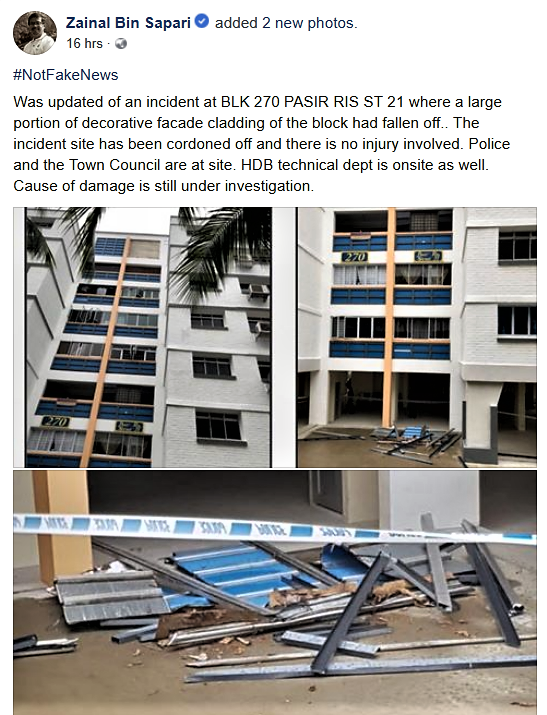 Was updated of an incident at BLK 270 PASIR RIS ST 21 where a large portion of decorative facade cladding of the block had fallen off.. The incident site has been cordoned off and there is no injury involved. Police and the Town Council are at site. HDB technical dept is onsite as well. Cause of damage is still under investigation. 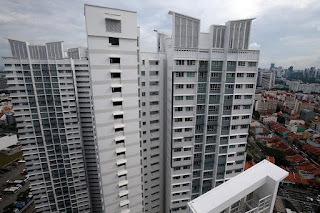 An investigation on 40 buildings in Singapore showed that 14 of the 19 buildings tested fell short of fire safety standards, revealed the Singapore Civil Defence Force (SCDF) on Thursday (24 August). The investigation came after SCDF found that the composite panels used at an industrial building at 30 Toh Guan Road, which caught fire in May and resulted to the death of one person, were not of Class ‘0’ standard as required under the Fire Code. Among the buildings that were found to have used non-Class “0” claddings include The Peak @ Cairnhill I and II condominiums, Teaching Blocks 1 to 10 of Singapore Polytechnic, JTC CleanTech Two, 321 Clementi mall and Our Tampines Hub. The other 21 buildings are yet to be tested. Up to 40 buildings in Singapore may have cladding made from materials that do not meet SCDF’s fire safety requirements, said SCDF on Thurs. The matter came to light during investigations into a fatal fire at Toh Guan Road on May 4, which revealed that the cladding used on the building’s external walls were not non-combustible or certified as Class ‘0’ standard required under the SCDF Fire Code. Extensive investigations found that 40 other buildings could potentially have used non-Class ‘0’ composite panels as cladding on their external walls. 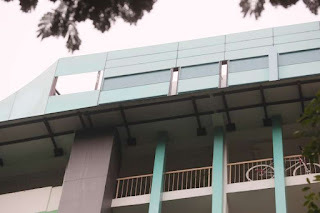 The Peak @ Cairnhill I, The Peak @ Cairnhill II, Our Tampines Hub and Singapore Polytechnic were among 11 buildings that used the non-class ‘0’ cladding, which have yet to be removed. Three buildings that have had their unapproved cladding removed are the Clementi Fire Station and the McDonald’s outlets at Yishun Ave 60 and 152 Bukit Batok St 11. 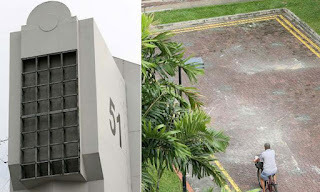 The external walls of 36 buildings in Singapore may have used materials that do not meet the Singapore Civil Defence Force’s (SCDF) fire safety requirements. Of the 41 buildings on SCDF’s checklist, 5 have been given the all-clear, the authorities said on Thursday (Aug 24). The discovery came after an industrial building at 30 Toh Guan Road caught fire in May, claiming the life of a 54-yr-old woman. Investigations found its external composite panels, supplied through a sole local distributor, did not meet the Fire Code’s standards. 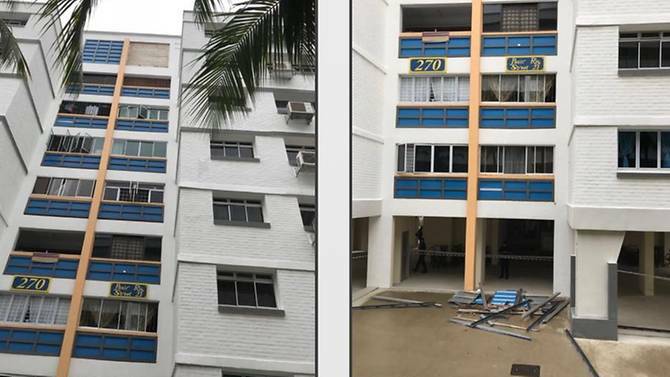 An HDB block at Indus Road has been cordoned off after 2 aluminium panels on the buildings fell off on Saturday. There were no reports of injuries. She added that blocks 78 & 79 nearby were also cordoned off as a precautionary measure as they had panels similar to the ones that fell off. No one was hurt by the slab, which the newspaper understands measured roughly 4m long & 2m wide. 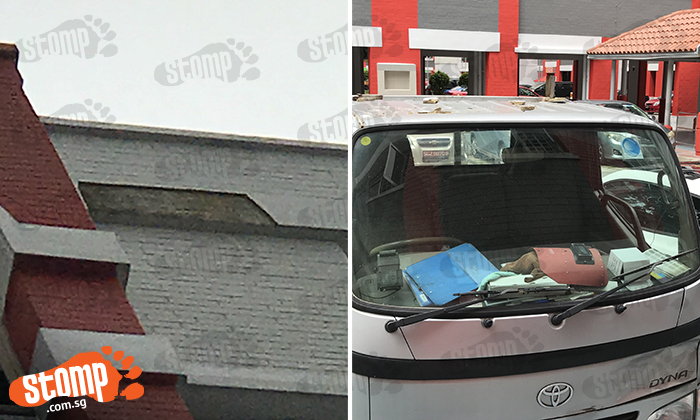 Stomper Andy saw the aftermath after a slab fell from the top storey of Block 449 Hougang Avenue 10 at 11am today (Nov 27). The Stomper saw police & town council staff cordoning off the area. Photos and videos the Stomper sent show debris spread across a wide area at the foot of the block. 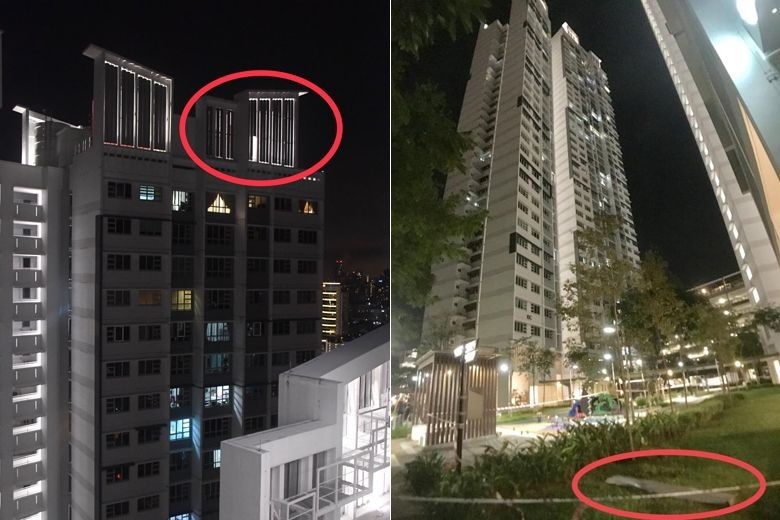 A concrete slab fell 40 storeys from the roof of a block at the Trivelis - a Design, Build & Sell Scheme (DBSS) project by the Housing and Development Board (HDB) at Clementi Avenue 4 - onto a playground below. Stomper G received WhatsApp messages from a friend living in the area, warning her about the incident which happened last Thursday (Nov 16). One of the messages showed a screenshot of Facebook user Ho Guo Liang, who posted a response seemingly from the Town Council. 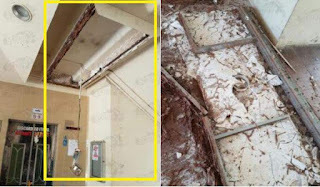 A 70-yr-old woman who got up in the middle of the night to visit the washroom got a rude shock when parts of the kitchen ceiling "about the size of a mahjong table" crashed to the floor in front of her. The incident happened at Block 51, Marine Terrace, on Monday (Feb 6) at about 2.30am, Shin Min Daily News reported on Tuesday (Feb 7). Retiree Chen Xiuying told Shin Min that she had been on her way to the washroom when a large slab fell from the kitchen ceiling about 2m away from her. 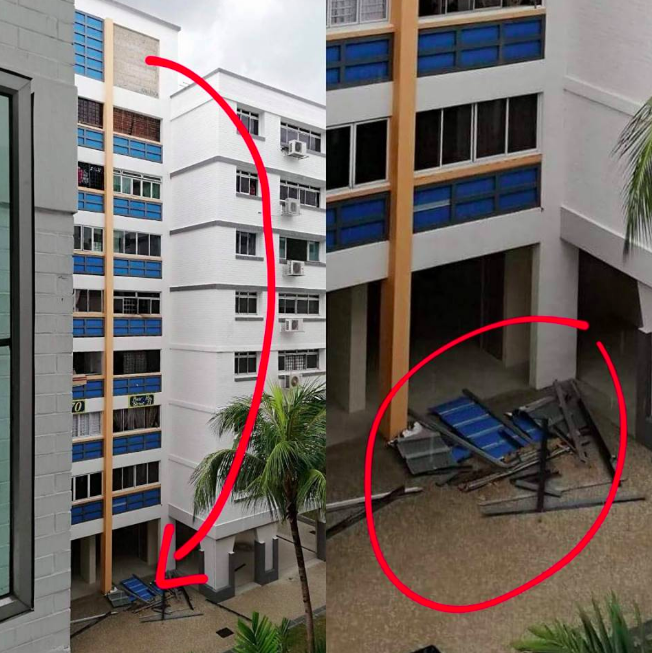 Checks by authorities have revealed that the concrete sunshade that toppled in Tampines in September was missing reinforcement bars (those things inside you don’t see that are meant to keep the thing from collapsing). It was the only one in the surrounding area missing those reinforcement bars, and now that BCS is investigating where this was due to the contractor breaking building regulations. This all comes after a report that was filed by a professional engineer hired to look into the incident. Now, the worrying part is why checks were not carried out before residents were allowed to move in – it’s a missing part that caused the collapse. 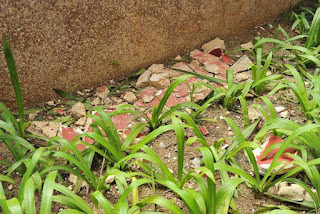 She heard the loud crash, peered out her window and saw, to her horror, that a piece of her neighbouring block's building facade had fallen and crashed to the ground below. "I was shocked to see a missing slab of wall on the block opposite. Luckily, it happened quite early in the morning and no one was hit. "How can a slab of wall fall off just like that?" the resident, who wanted to be known as Madam Ng, 65, told The New Paper yesterday. HDB BUILDINGS NO LONGER SAFE? CHEAP LABOUR & LOW COST MATERIALS TO BLAME? HDB buildings appear to be no longer safe. According to Shin Min Daily News, “a slab of the roof-wall” fell from Block 51 in MacPherson Road 2 days ago. The size of the calcium silicate board which measured about “4 metres by 2 metres” – slightly larger than 2 king size mattresses – could have caused a number of fatalities. Again, lady luck was smiling at us. Just last month a concrete sun breaker weighing a few hundred kilos was dislodged from another HDB block in Tampines and last year, a smaller slab of concrete fell from this block (below) in Whampoa. 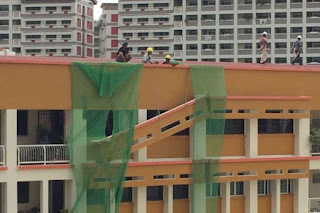 The common cause of all these preventable incidents has been confirmed: PAP has been employing cheaperer labour and using lowest-cost materials to increase profitability. After this incident, the BCA, HDB and Marine Parade Town Council sprang into …. wayang. And soon, the issue will be swept under the carpet. The party accountable for the honest mistake will not be disclosed. 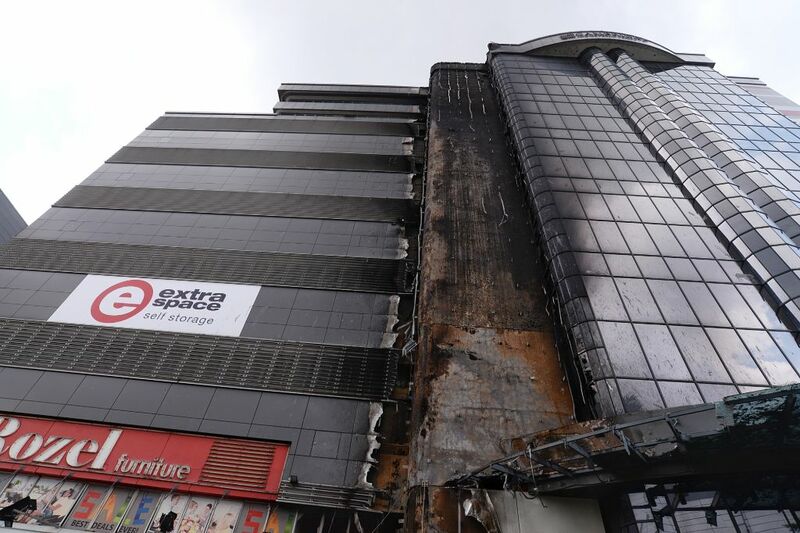 MacPherson MP Tin Pei Ling has said that she is hoping that the authorities will consider revamping these few blocks in the near future – standard PAP fire-fighting protocol. 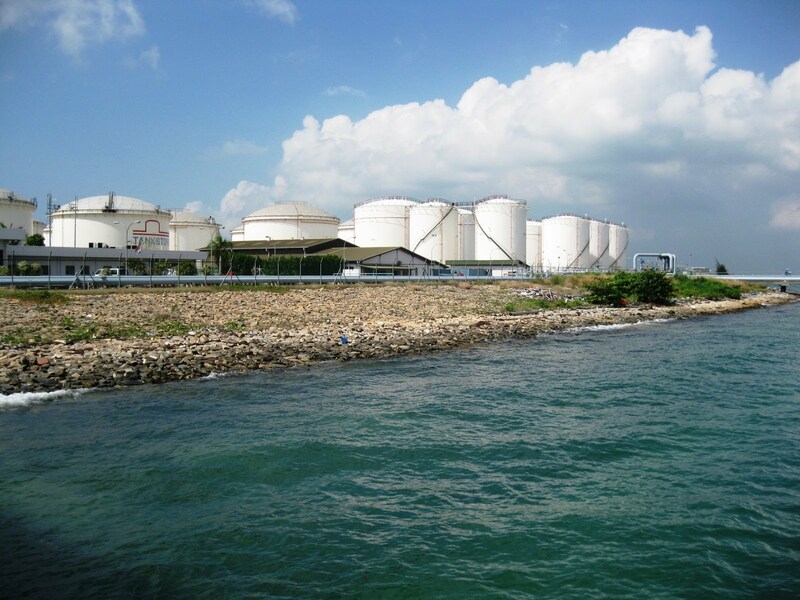 As our infrastructure ages, we should expect more PAP-created issues to surface. How not to when they have been focused on milking citizens and taking economic shortcuts without accountability? 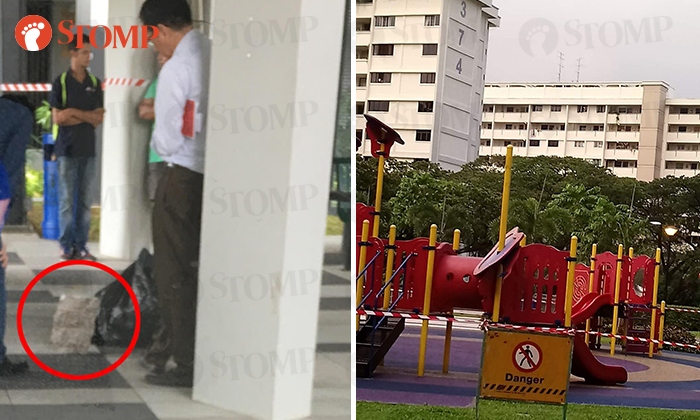 He was collecting money from a customer at his drinks stall when he heard a loud crash. When Mr Zhang realised what had caused the sudden sound, he was shocked. Several ceiling boards in the coffee shop had fallen onto the floor and smashed into pieces. "It was a very loud bang. There was a lady walking past & it nearly hit her," the drinks stall operator told The New Paper yesterday. 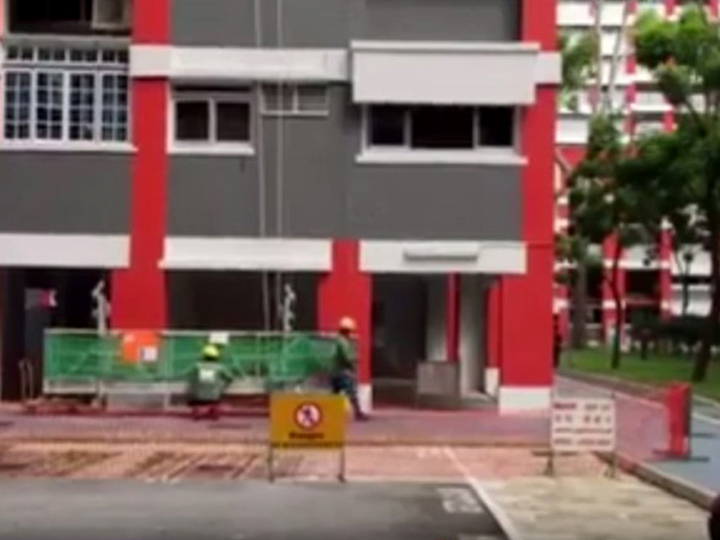 A concrete structure that gave way outside a four-storey HDB block along Tampines Street 23 has been removed, after close to seven hours. 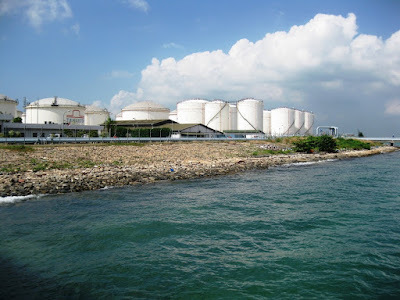 No one was hurt as a result of the incident that happened on Sunday morning (Sep 25). The structure serves as a sun shield for a unit on the fourth storey of Block 201E. According to Member of Parliament for Tampines GRC Cheng Li Hui, an engineer and safety officer have assessed the situation. Tampines Town Council, which is the building owner of the HDB block, was directed by the Building and Construction Authority (BCA) to engage a professional engineer to advise on the necessary measures to remove the dislodged sun breaker, as well as to carry out a detailed investigation and recommend permanent rectification works. There have been recent incidents such as one in July last year where a plaster slab measuring 1.5 m by 0.6 m fell from a height of 18 storeys. It came off the facade of a 17-year old HDB block in Choa Chu Kang Avenue 4. In December last year, a concrete slab measuring 3 m by 1.8 m fell from a pedestrian bridge. Fortunately, no one was injured. The ST article reporting the incident was all BCA and LTA wayang: there was no mention of accountability. Overhead bridges are assets belonging to LTA and the government is also indirectly the largest employer of foreign construction workers. 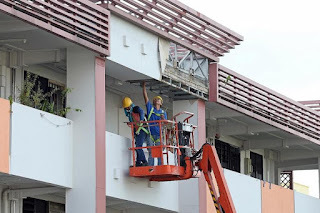 Although the supply of skilled construction workers is inelastic, PAP has somehow managed to find sufficient manpower from third world countries. What is worrying – many of them could have been only general workers sent for an expedited course for certification and recruited by private construction companies. If IDA could employ Nisha with a fake master’s degree, couldn’t LTA/HDB contractors have hired unqualified workers? related: HDB blocks falling apart? Mr Choo Keat Thin, 59, was watching television yesterday when he heard a loud sound outside his living room windows on the fourth storey. The concrete sunshade, or sun breaker, on the building exterior above the windows of his flat had become dislodged on one side and was resting on the sunshade on the 3rd storey. “It was 10.05am, and the whole floor shook. 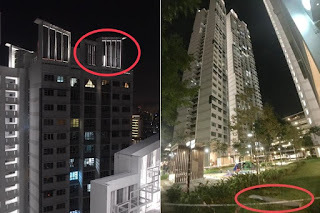 I quickly looked out, and I saw the beam dangling (at a) 45-degree (angle),” said the businessman, who lives in Block 201E Tampines Street 23. 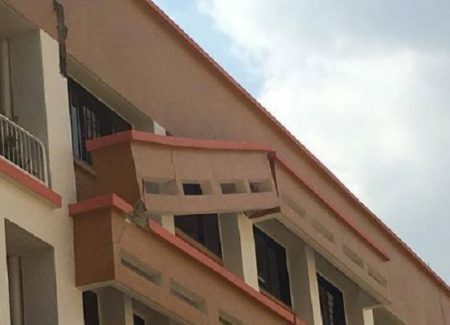 A concrete feature on the exterior of a Housing & Development Board (HDB) block collapsed on Sunday (Sep 25) morning, but the authorities say no injuries were reported. 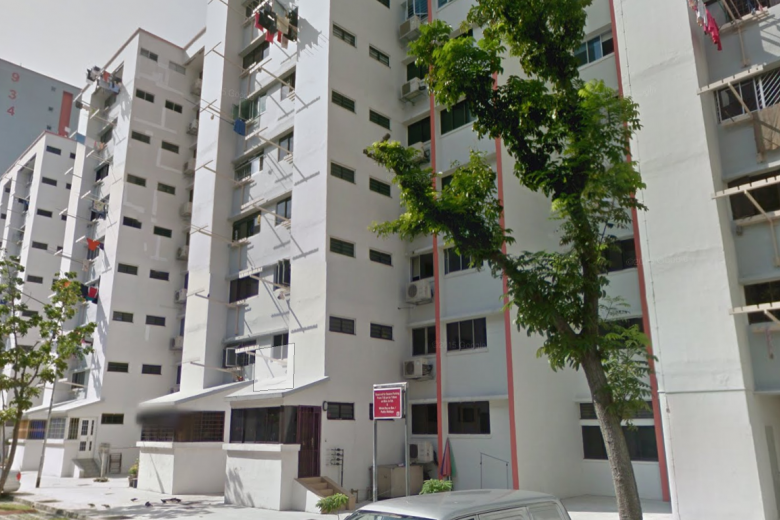 The incident occurred on the 4th floor of Block 201E, Tampines Street 23, around 10:05am. 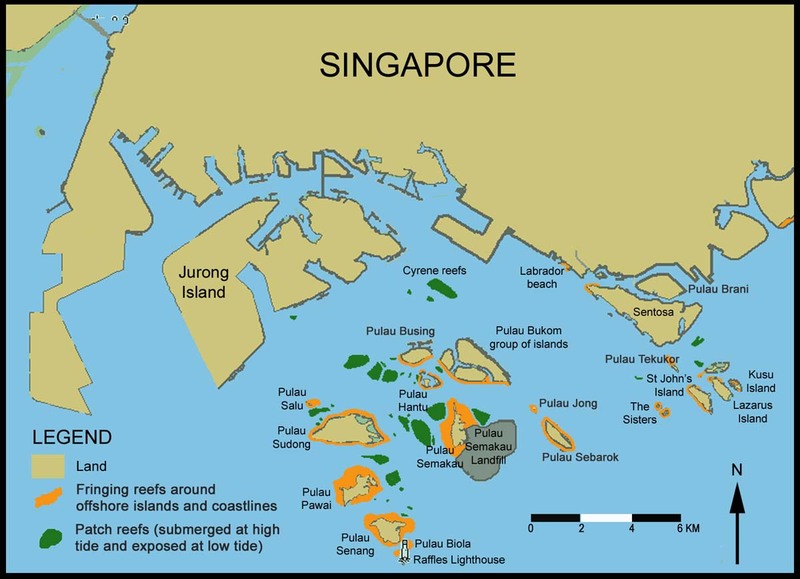 No Singapore Civil Defence Force vehicles were dispatched, The Straits Times understands. Police arrived on the scene to cordon off the area. Received a call this morning and rushed over. One side of the sun breaker broke and landed on 3rd storey breaker. We have secured the breaker with tension cords to anchor points on the rooftop, activated the crane and the engineer is doing a thorough inspection now. 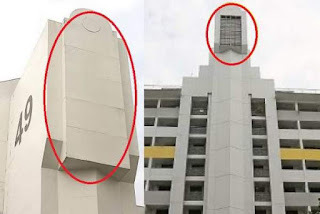 We will be removing this and HDB and TC will be working together to inspect the rest of the sun breakers after this, to ensure their integrity and safety. 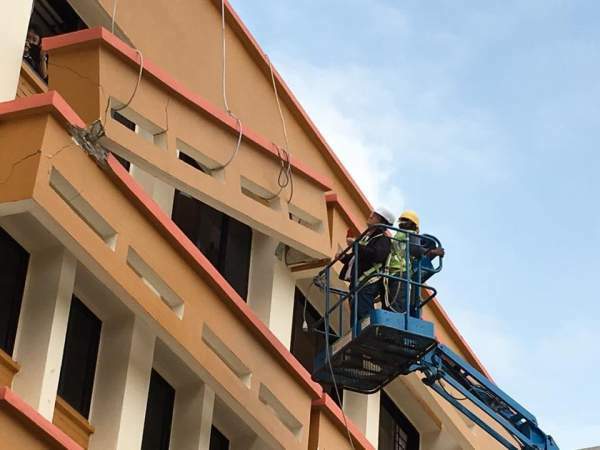 A concrete facade at a four-storey HDB block along Tampines Street 23 was unseated and fortunately did not drop down from the top floor. 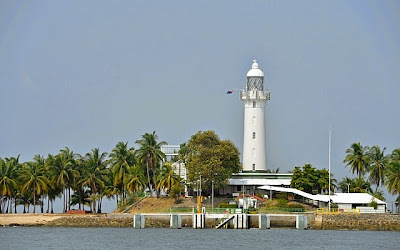 No one was hurt in the incident that happened on Sunday morning, 25 September. The collapsed structure functions as a sun shield for a unit on the fourth floor of Block 201E. 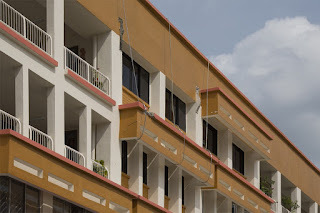 CNA reported the owner of the HDB building block, the Tampines Town Council, has been directed by the Building and Construction Authority (BCA) to engage a professional engineer to advise on the necessary procedure to remove the relocated sun breaker, and to conduct an investigation and recommendation of permanently rebuilt works. RESIDENTS of the Tampines flat where a concrete sunshade partially dislodged late last week are worried that the other sunshades might give way too, given that the area is a neighbourhood centre with a thronging thoroughfare on the ground floor. 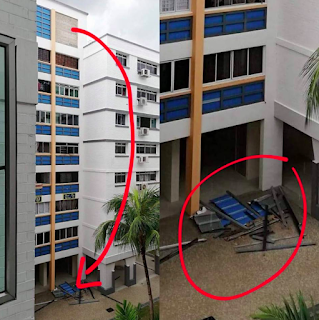 On Sunday morning (Sept 25), a 5m-long concrete sunshade outside a fourth-floor flat at Block 201E, Tampines Street 23 dislodged partially and landed on the corner of the sunshade of the floor below. Although no one was hurt, it gave residents quite the scare, and now residents are afraid that other sunshades – at least seven on the same facade – might follow suit. 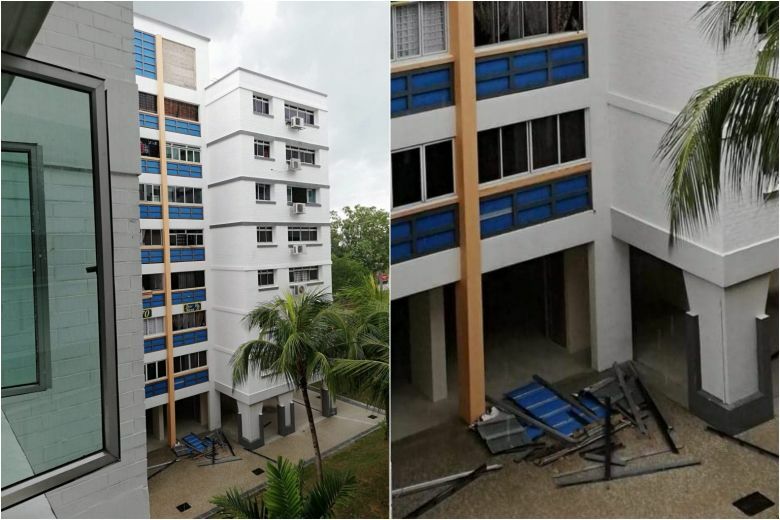 Residents of Block 464, Choa Chu Kang Ave 4, said it was fortunate no one was hurt, as the walkway below is a popular one. 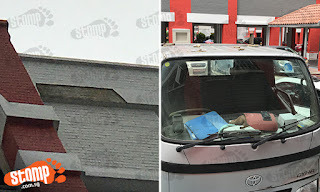 A slab of plaster fell 12 storeys from the top of Block 449 Hougang Avenue 10 at 11am on Sunday (27 November), hit a lorry which was parked nearby and dented its roof. Fortunately, nobody was injured during the incident. There are only 60 executive maisonette units in this building. 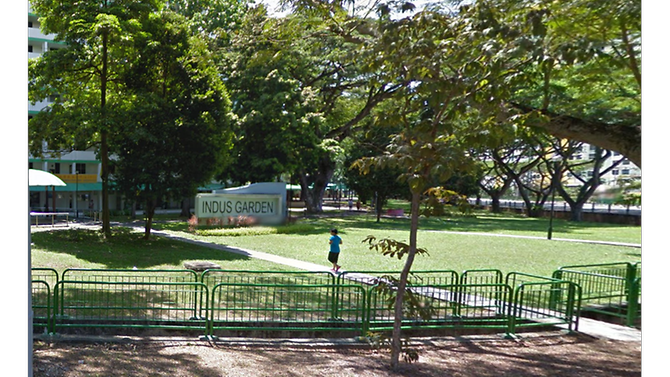 It was build in 1991 and it falls under the purview of Ang Mo Kio Town Council. 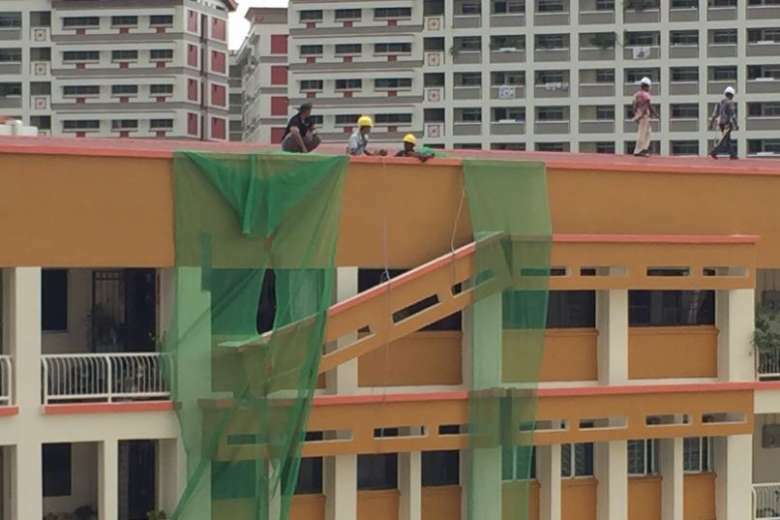 In the 3rd such incident in three months, a slab of plaster fell 12 storeys from the top of a Housing Board block in Hougang on Sunday morning. No one was injured by the slab, a piece of the facade measuring 1.2m by 0.6m. 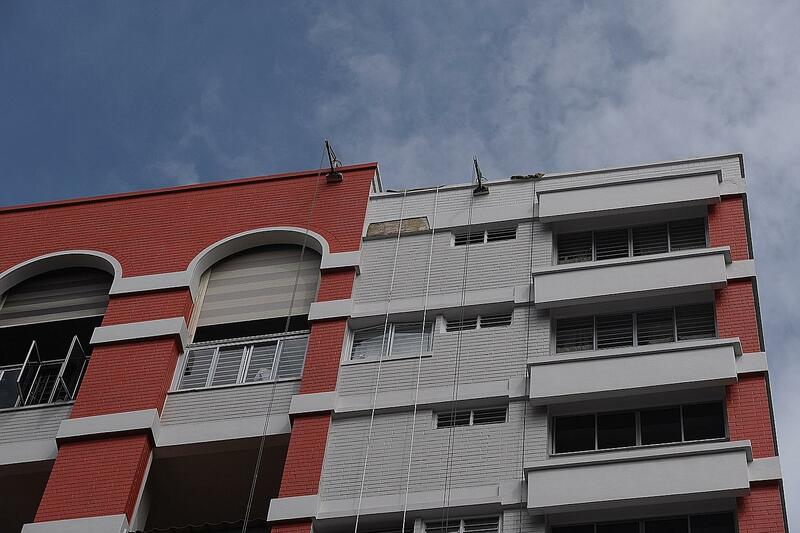 The facade had been checked recently, according to the estate manager, Ang Mo Kio Town Council (AMKTC). Resident Andy Loh, 39, heard a loud noise around 11:00 am on Sunday. 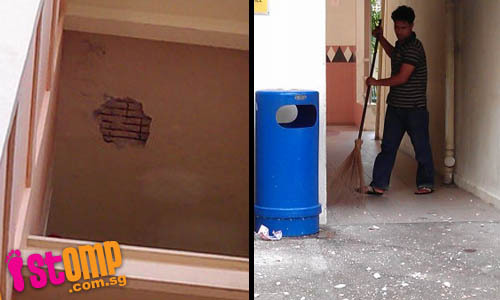 A patch of plaster fell from the ceiling at a HDB block in Tampines at around 1.30pm on Sun. 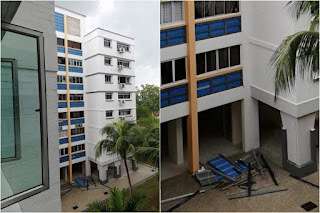 A contributor to Stomp said he was at home in his second-floor unit at Blk 933, Tampines St 91, when he heard the loud bang of the falling plaster, which hit the floor along a first-floor corridor. 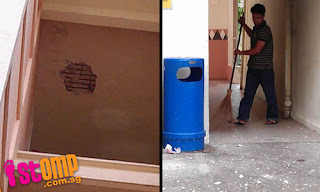 A Tampines Town Council spokesman told ST that only non-structural, surface-level plaster fell off at a “specific and very localised” location. A team was despatched to repair the ceiling on Mon morning and repair works are underway. The spokesman declined to give a specific time for the completion of works, but said that the works involved included putting in a new bonding agent and replastering the ceiling. The spokesman added that the incident was caused by spalling. Preventive measures currently in place at Tampines Town Council include teaching town council staff to look out for tell-tale signs of impending spalling. This includes rust marks, cracks and slight bulging. The spokesman also added that residents could help by looking out for such signs and informing their town council. 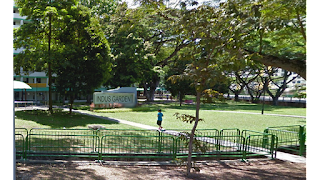 “What the hell” and “KNN” probably rolled off the tongues of some Choa Chu Kang Avenue 4 residents yesterday morning, as they found broken-off concrete blocks littering the pathways near block 464. Looking up, they discovered that the blocks were part of the building wall which broke off from the 16th floor! The big break likely took place in the wee hours of morning. According to one resident, he had sent his daughter home at around 2am and didn’t find any debris on the ground, but to his horror, the concrete blocks were there at 7am when he went downstairs. 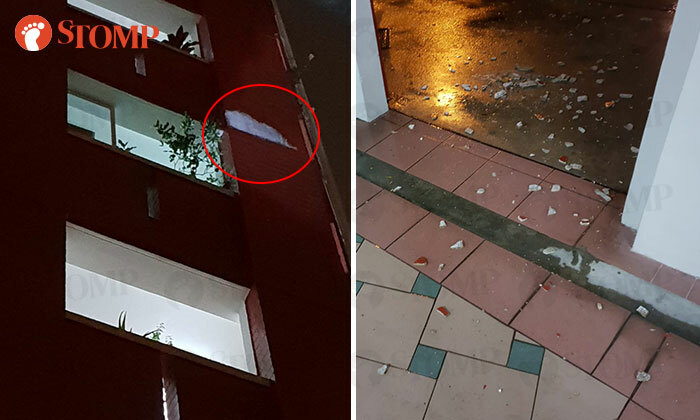 STOMPer David was shocked to see a large chunk of plaster that fell from the 9th floor ceiling of a HDB block at Hougang Avenue. He hopes the relevant authorities can look into maintaining the building and the ones in the older estates. "A concrete slab fell off the 9th floor ceiling of block 601, Hougang Avenue at around 10 am today (Nov 15). I did not witness the exact moment when the slab fell off. I must have missed it by 10 to 15 minutes. Thank God no one was hurt! Can the authorities look into not only our building but the ones in the older estates? It must have happened due to the rain and perhaps stagnant water accumulating on the rooftop of our flats." Picture 1 to 6 of the gallery show the chunk of plaster that fell off the HDB ceiling at Hougang, while the other two pictures are of the incident at Choa Chu Kang. 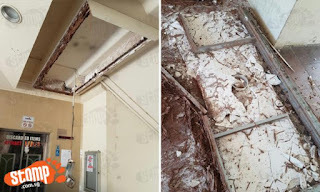 For more than a year, residents at Block 9, Toa Payoh Lorong 7, said they have been seeing pieces of the false ceiling at the top floor falling onto the common corridor. 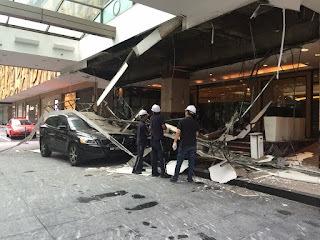 On March 18, after a heavy afternoon downpour, it took a turn for the worse when a chunk of the false ceiling & part of the facade fell 11 storeys down, leaving a gaping hole about 4m wide. 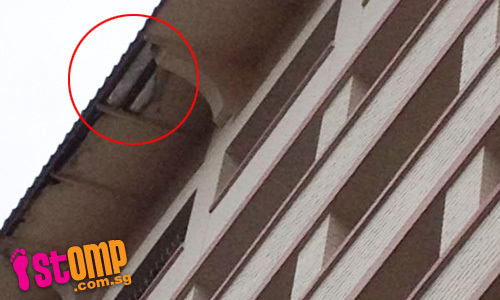 Two metal bars fell from a HDB block on Sat, but no one was injured. 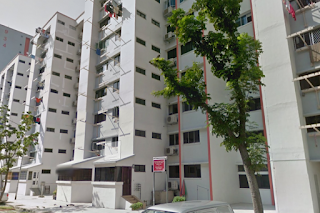 The incident happened at about 12.45pm on Sat at Blk 77, Indus Road, Lianhe Wanbao reported. The bars were about 3m long, the Chinese evening daily said. The blocks were built more than four decades ago but have been upgraded. MP for Jalan Besar GRC Lily Neo said on Mon that HDB sent engineers to investigate. They will also “remove all other metal bars if necessary” to prevent the same incident from happening again. 3 renovation workers and a security officer were injured after part of a ceiling board at the Resorts World Sentosa (RWS) casino collapsed yesterday. 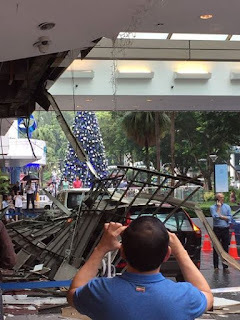 External contractors were carrying out enhancement works when part of the ceiling board leading to the mezzanine gaming area fell around 10am, a spokesman for RWS told The Straits Times. "There were no guests at that area during the incident. One security staff and three external contractors sustained minor injuries," the spokesman added. 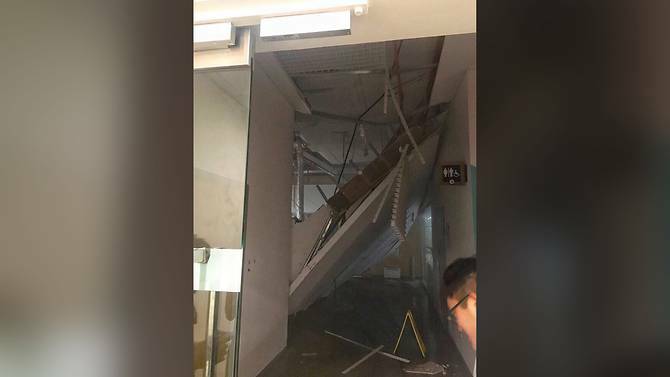 A ceiling at the basement of Singapore Management University's (SMU) School of Information Systems collapsed on Tuesday (Oct 24). 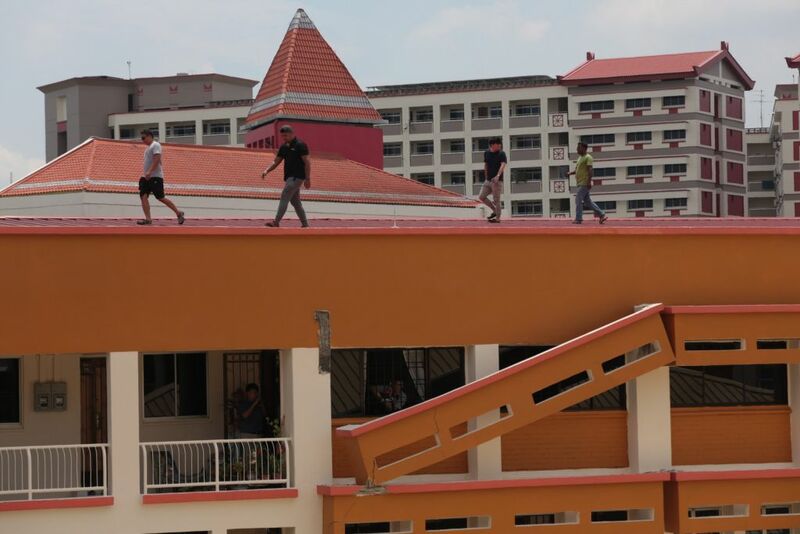 The false ceiling at the recess area collapsed at 5pm, the university has confirmed. In response to Channel NewsAsia's queries, an SMU spokesperson said preliminary findings showed that a drainage pipe above the ceiling had leaked & water had seeped through, causing the false ceiling to collapse. Some of the water entered a portion of the study area located next to the affected space, she said. 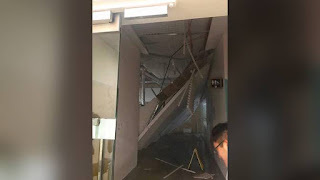 The ceiling of Lecture Theatre 1, at Nanyang Technological University's (NTU) North Spine, had collapsed earlier that morning. NTU sent an e-mail to affected students to inform them of the collapse and the change of venues for some of their lectures. No classes will be held there for at least a month. Mr Adzizul, who is a final-year mechanical engineering student, told The New Paper that his classmates were in the theatre, sitting closer to the front. As he had not attended the lecture, he was viewing a recording that was posted online after the lecture ended. 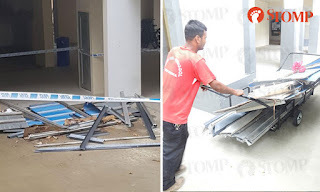 Stomper KaliDass was shocked when he saw that the false ceiling at the void deck of Block 807 Tampines Avenue 4 had collapsed, at around 1pm today afternoon (Oct 17). Photos he sent Stomp via WhatsApp show a light dangling from the exposed ceiling and chunks of cement plaster on the ground. 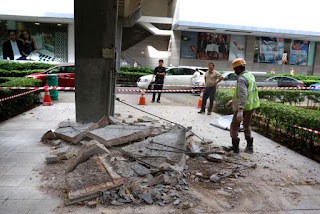 KaliDass, who said he heard a loud bang when the incident happened, added in a phone interview: "The false ceiling in front of Lift A at the ground level of Block 807 Tampines Avenue 4 collapsed. 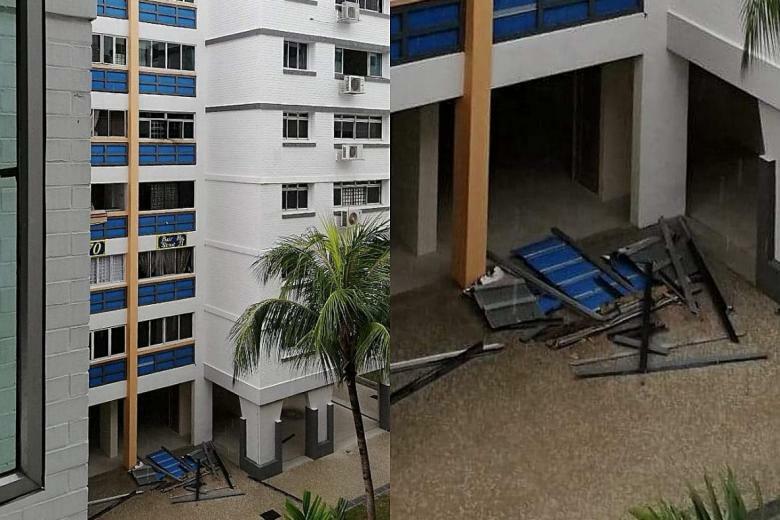 The false ceiling at the void deck of Block 807 Tampines Avenue 4 collapsed at around 1pm today afternoon (Oct 17). Fortunately, the ceiling did not land on anyone. What remains of the fake ceiling is a light dangling from the now exposed ceiling. Chunks of cement plaster are on the ground. First sun breaker, now fake ceiling. 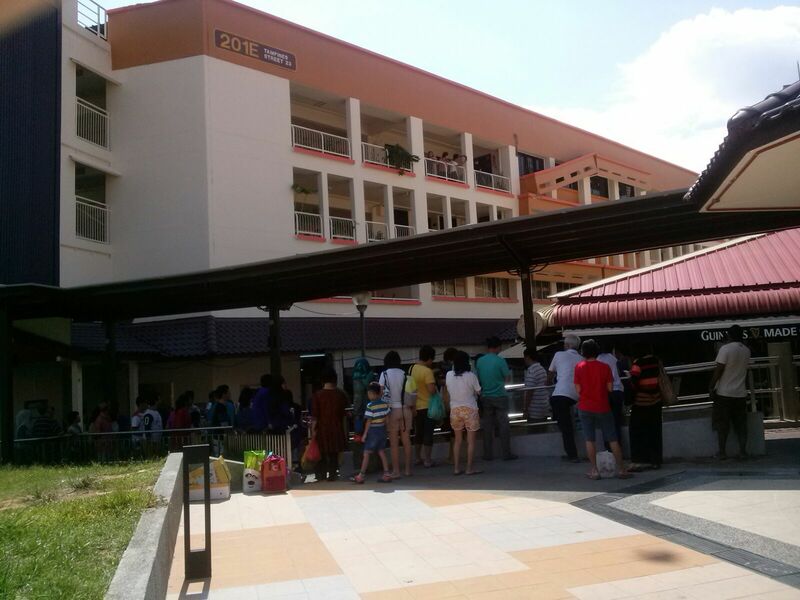 Tampines is turning into a slum! Heavy rain yesterday proved too much for the false ceiling at Westgate mall and caused a small section to shatter. 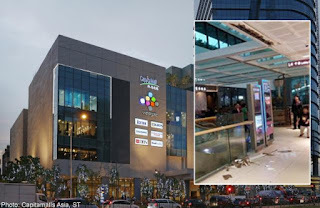 Shin Min Daily News reported that the incident happened around 3.30pm at the fourth floor of the shopping mall and left a 1m hole in the ceiling. A 26-year-old shopkeeper told Shin Min Daily News that three or four men were almost hit by the ceiling fragments. 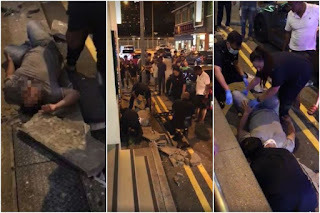 2 women escaped being injured by a slab of concrete that fell from a pedestrian bridge outside Orchard Plaza early Wednesday morning. 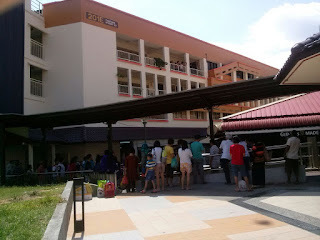 Just minutes before the concrete fell, the women had walked under the bridge linking Cuppage Plaza and Orchard Plaza. A witness, who wanted to be known only as Mr David, 48, said he had stepped out of a pub in Cuppage Plaza for a smoke when he heard a loud thud across the road, about 3 minutes after the two women walked past. 2 cars, one a Malaysian-registered SUV, were at the hotel's front porch when the incident happened. 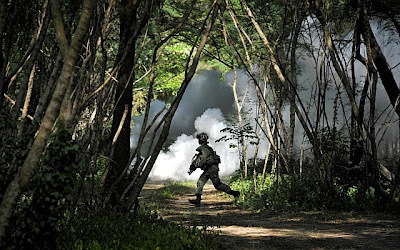 A Channel NewsAsia reporter at the scene said that two police cars arrived in the first few minutes, followed by the Singapore Civil Defence Force (SCDF) at 4pm. SCDF told Channel NewsAsia it deployed one fire engine and one ambulance in total to Hilton hotel that day. Officers spent about 10 minutes inspecting the wreckage, which was occupying the entire hotel front porch, our reporter said. During the inspection, only guests were allowed through the entrance, according to a hotel representative.